This is Harper's story--her story of meeting Grace for the first time in 1984 during tennis camp and of going to private school in Arizona, raised more by her grandparents than her world-traveling parents. Her world revolves around Grace and most of the time Grace doesn't even realize it. Harper knows she loves Grace, and as they pursue college and summer trips together, they finally admit their love for each other. Yet it is a love in denial: of course they love each other, of course they are intimate, but that doesn't mean they are lesbians! Or does it? As Harper slowly comes into her own identity, she finally admits the truth of her love. Can she and Grace take that final step to truly be together, or will their own privileged circumstances keep them apart? Sometimes when a story features rich kid characters, it is hard to get in the mood. The privilege of Grace and Harper's early years really sets the tone of most of the story. The money, the private school, the lack of financial issues in college, the summer trips abroad. It both scrapes at my nerves with the sense of entitlement that all the characters seem to have from the beginning and makes the story that much more believable when conflicts arise with Grace's mother and boyfriend, and surrounding Grace's trust fund. 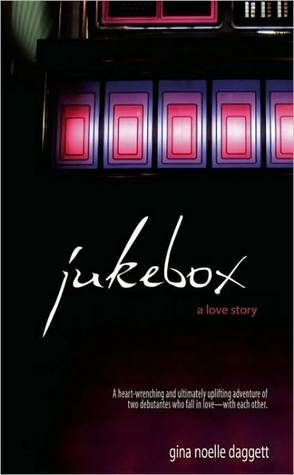 While the start of Jukebox deals with the back story from their childhood to the fateful evening that Harper declares her love and identity to Grace, the second half of it is set twelve years later, in 2005, as both Harper and Grace deal with the choices and feelings of the past. For me, this was the hardest part of the book to connect with. While some of the underlying feelings are completely believable (who hasn't pined for a lost love? ), the way that Daggett set up and broke various plot lines and characters in the story were rather hard to read without rolling my eyes. I also struggled to feel any empathy for Grace. She reminded me of those brash, assuming men in the Harlequin romances that turn the woman inside out and then say, "Hey, guess what, I do love you!" Um, no thank you. On the plus side, I did connect to Harper's struggle with her love for Grace and denial of her sexual identity. I also enjoyed Daggett's scene-setting throughout the years. As a girl of the 80s who loves a working jukebox, that was a big draw for me. It was the songs in the jukebox that let Harper first express herself, from "Lost In Your Eyes" to "I Hate Everything About You." Chapters are not numbered, instead they are titled with expressive songs through the years. Any woman who has made a mix tape for her love will enjoy the weaving of music through the book. Gina Noelle Daggett was a 2011 Golden Circle Literary Award finalist as a debut author for Jukebox.